The Photography Show is the destination event for all image creators. 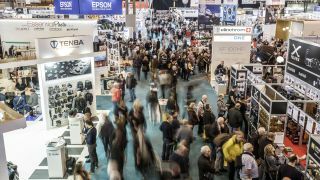 Whether you're a seasoned professional, a keen enthusiast or you've just been bitten by the photography bug, you'll want to head to the Birmingham's NEC on 17-20 March to be inspired by a host of experts, learn new photography and video techniques, get hands-on with the latest kit and find fantastic deals. Photography icons Art Wolfe, Gered Mankowitz, Bruce Davidson, Zed Nelson, Ami Vitale, Erik Johansson, Brent Stirton, Daniel Berehulak, Jasmine Star and Miles Aldridge will take to the Super Stage this year. Each will offer insights into the images they’ve captured, their eventful careers and the challenges they’ve faced along the way. Tickets to see these living legends of photography cost £10 per session (in addition to having an entry ticket to The Photography Show itself). From the latest cameras, lenses and bags, to albums, clothing and gadgets you didn’t even know you needed, you'll find the latest kit and accessories from over 200 leading photography brands including Canon, Nikon, Fujifilm, Olympus, Panasonic and Sony at the show. With the chance to try before you buy and some great bargains up for grabs, you’ll be spoilt for choice. The Live Stage promises to put you right at the heart of the action and excitement of a live shoot – you'll be entranced and inspired by a variety of demos offering practical insights into taking beautiful shots of a range of subjects, in character and in action, with lighting and settings thrown in. Everything from shooting the 'big day' to a live catwalk show awaits! Behind the Lens They say a picture is worth a thousand words, and at The Photography Show this year a host of imaging experts will step out from 'Behind the Lens' to reveal how they captured some of their most stunning and specialist shots. The Great Outdoors New for 2018, The Great Outdoors will focus on techniques and styles across a range of subjects, including dramatic landscapes, back garden bugs and tackling portraits, weddings and special occasions against all the elements. Speakers will include Tania Esteban, John Nassari, Joe Cornish, Ben Cherry, Chris Upton and Thomas Heaton. Photo Editing Theatre Our Photo Editing Theatre is the place to be to brush up your post-production skills, discover new editing techniques and applications, and gain inspiration on post production whatever your level. Featuring talks from the best in the business, you’ll leave with tons of ideas for improving your workflow and making your finished images look even better. Video Stage Our pro photographers and videographers will give you the low-down on the skills you need to create great video, the kit that’s out there and their approach to producing memorable, eye-catching footage. If you’re looking to take your photography journey to the next level, why not consider one of the masterclasses and conferences on offer at The Photography Show this year. Sessions are designed for all levels: beginners, professionals and those thinking about making the leap from amateur to pro. The People's Gallery A collection of photographs submitted by our visitors, for our visitors. Last year’s stunning images caused a stir across national media – could your photography be a part of this gallery in 2018? Outdoor Photographer of the Year Now in its seventh year, the competition categories include ‘Live the adventure’, ‘At the water’s edge’ and ‘Spirit of travel’, to name a few. The winner will be announced on the The Great Outdoors stage on Saturday, 17 March at 14:50. Digital Camera Photographer of the year 2018 See the winners of all of eight rounds of Digital Camera magazine’s Photographer of the Year 2018 competition, as well the eight category winners in the special Young Photographer of the Year 2018 for Under 25s. The overall Digital Camera Photographer of the Year, and the overall Young Digital Camera Photographer of the Year will be announced during the Show. More information about the competition can be found at www.photocrowd.com/dcpoty. And that's just the tip of the iceberg, as there are a host of other great events you can get involved with when you visit The Photography Show. There will be bags of fantastic photo opportunities around the show, so remember to bring your camera – or even snap away on your phone – and use the techniques you’ve acquired straight away. Then get social and use the show hashtag #UKPhotoShow to share the images of your experience at The Photography Show. Tickets for The Photography Show are on sale now at www. photographyshow.com. TechRadar readers can save £3 on a standard adult entry rate (advance), dropping from £13.95 to £10.95. Use the code TECHRTPS18 at the checkout. It'll expire on 14 March 2018 and cannot be used in conjunction with any other discount including concession rates. Additional talks, seminars and workshops can be booked in addition, at a price of £10 each. Student entry will be free of charge on Tuesday 20 March. Check out these great money-saving offers on the very best photography magazines, delivered straight to your door!